AMINO K HIGH SEQUESTERED NUTRIENT (N)1.0 (P)7.0 (K)18.5 Benefit: Encourages strong root growth and ..
AMINO K HIGH SEQUESTERED NUTRIENT (N)1.0 (P)7.0 (K)18.5 Benefit: Encourages strong root growth and w..
Bio Diesel is an extreme bud fuel designed for fast growing, heavy blooming hybrids. Growers using B..
Phosphorus Potassium (P K) additive for the development of more flowers and heavier fruit. Use at 1-..
Buds A Million Liquid Calcium Magnesium Complex Protect plants agains problems such as Stunted Growt..
CANNABOOST Accelerator CANNABOOST Accelerator boosts the metabolism of your plants. 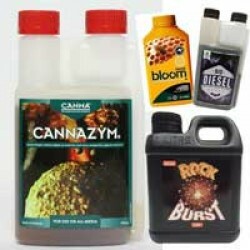 This is importan..
Canna Boost 250ml CANNABOOST Accelerator CANNABOOST Accelerator boosts the metabolism of your plants..